A proposal for developing a roadmap for development? Chris, this post is a real service. Thank you. You've hit just the right timbre with your haiku and your focus on social networking. No thunder has been stolen, though perhaps a little has been produced. ...at the close of the session we discussed outreach & engagement opportunities and someone mentioned social networking, and there was a collective groan throughout the audience. Depressing, but not surprising. I think us non-silverbacks just have to stick together and weather this storm of late-adopter nay-saying. We're getting professional benefits from it, and ultimately this will start to show. A true generational silverback, I have seen too much of this to be depressed. It seems like another "let's be just so clever with what we've got" meeting. I was hoping for a sock knocking off vision but nothing that was reported had not been proposed at any one of a number of previous biodiversity meetings. But hey, it looks like it was a sound reaffirmation that biodiversity informatics 'is a good thing' and I did not detect any show-stopping backward steps. Rod Page's challenge showed us a new born baby - as an application, absolutely useless, but as an idea and an opening door it is going to spawn some humdingers. It is a shame this level of uncontrolled and uncontrollable innovation and creativity was not more strongly represented in the planning room. But that is probably what the first three days were for. As I said on an earlier twitter, I have never learned so much or had so much fun by not going to a conference. Without disagreeing with Chris' observations of the workshop, I think the lack of enthusiasm for a social networking push may have come, in part, from the VERY low level of activity we got on the Online Conference Community discussion fora during three months of run-up to e-Biosphere. Where were all the Tweeters for months when we kept calling for input and pre-Conference chatter? I confess to being a silver-haired Boomer, and as one of the conference organizers that may mean I'm a silverback, but that doesn't mean that I'm moss-backed, does it? Where were all the Tweeters for months when we kept calling for input and pre-Conference chatter? If this is really what the silverbacks thought, then it's yet further demonstration of a complete lack of understanding of how things work. It's the "if you build it they will come" mentality. Nope, that's not how it works. There are minor reasons why I think the "official" forum failed (awful software, yet another user name/login combination to remember, etc. ), but the big reasons are incentive and persistence. If I write something I want it to be read. That means (a) I need to put it in a place where I know people will see it, and (b) it will be in that place long enough for people to find it. The official forum provided neither. There was no guarantee that there would be a large community of users, and even if there was, I've no guarantee that the e-Biosphere web site wouldn't go offline after the conference (a conference is a singular event, the conversation lasts as long as people are interested). But if I blog it I have a guaranteed audience (however small), plus I have some ownership over the content. In the same way, Chris could have posted this post as a comment on one of mine, but that means his thoughts are forever part of my blog, not his (incidentally, this is one reason I've switched my blog comments to Disqus so that I -- and commenters on my blog-- can manage comments across blogs). Unless you provide incentives such as an audience and persistence, it won't fly. You're being naïve if you think otherwise, and certainly naïve if you think that people will contribute to something just because you ask them. You really do need to ask "what's in it for the users?" Blogs and Twitter have the potential to reach much bigger audiences. 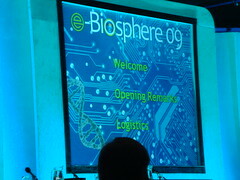 A mistake e-Biosphere made was thinking that it could attract and define the audience. The issues around e-Biosphere are much more wide ranging (and too important) to languish on the poorly designed forum pages of a transitory conference. Another consequence of trying to create a specific place for discusion is that it could be easily hijacked (which it was), in the same way that the venerable TAXACOM mailing list sometimes does. In summary, if the silverbacks write off social networking because one crappy, ill-informed attempt at it failed miserably, then they've merely reinforced the notion that they really, really, don't "get it." Last September in Edinburgh I suggested to David Schindel that some mechanism for online, 'social' pre-conference discussion might be useful, as I had seen it in action at ScienceOnline09 and SciFoo and it seemed to work well there (both used wikis and unconference formats, and ScienceOnline09 was particularly good about integrating with existing social networking tools: blogs, twitter and friendfeed). Then followed a series of emails amongst the silverbacks (cc'd to me) in which the idea was enthusiastically taken up. In the silverbacks' defense, at least two said then that they would need the advice of social networking experts in our community on how to use/integrate these tools for maximum participation. I'm not sure what happened between then and the launch of the conference website but somewhere someone must have decided against (given up on?) Web2.0. For future, FriendFeed can capture content coming in from many different social networking sites at once and create a live, threaded stream of online chatter that both users and casual visitors can see and comment upon. Intellectual property is a major issue here. Imagine other professional classes splurging their knowledge into a forum just because some one asked them to! How about lawyers or tax consultants? I am not suggesting that biodiversity informatics professionals are in it for the money but they do have to make sure their outputs are branded and 'owned'. They are also all very busy. I have totally lost track of the mailing lists and forums (fora?) and social networking sites and professional networking sites I am signed up for - some of them against my will. Please please stop! Points taken on many, not all of these comments, for which I thank you. Rod, another userid/password is indeed another barrier, as is getting used to another format for accessing and responding. We did, in fact, have a "Field of Dreams" mentality - if you build it, they will come. It worked for the Street Fair and the Challenges (two other e-Biosphere attempts to get ideas to the surface and generate discussion) and I was pleased with their results. Why should people have participated? To get their ideas for next-gen biodiversity informatics into the public square for open discussion. As posted, the goal was to have people develop short position papers before the conference about what their communities proposed for the next few years of R&D. We had hoped to make the breakout discussion sessions richer and deeper through some pre-conference discussions but it didn't work. Other reasons that you and Roger proposed (lack of an archive, IPR concerns)? Maybe, maybe not. CBOL is now organizing its third international conference and far from giving up on social networking, we're hiring a new web developer to engage it full-force. If we used the wrong tool for e-Biosphere, we'll try another and suggestions are welcome. For e-Biosphere, the issue of how we will communicate in the future was not resolved at the workshop and is a priority for Steering Committee discussion. I'm going to break the habit of a lifetime and praise EOL. The use of Flickr was inspired, (I made use of the EOL Flickr feed it in my ebio09 challenge entry). It's a big challenge to engage users, and it can be difficult to decide whether to create a new community, or engage with an existing one. This is why I've been suggesting that it might be more sensible for EOL to engage with Wikipedia and use that as the platform for species pages, rather than build its own. Of course, the downside is that an existing community may have a dynamic that's not always helpful (see the discussion a http://en.wikipedia.org/wiki/Talk:Sperm_Whale#catodon mentioned by Tony Rees). A Wikipedia/EOL combination is still in the cards and is looked upon favorably by many folks within EOL. The use of Wikipedia in a similar manner as the use of Flickr (for text contributions) was in our proposed workplan for last year, but we were asked not to implement that phase last year (for various reasons). The balance between "authenticated information" and "any information" is tricky, but those of us participating in the new media landscape tend to see it as less of an important distinction than traditionalists. I've spoken with many educators who say they will not let their students use Wikipedia, but they will let them use EOL (since we serve "authenticated" information). Of course, we all know many very smart people (scientists even!) who use Wikipedia a whole lot, so clearly most of the information there is good. My recommendation to educators in these cases is to not make blanket statements about trust worthy and untrustworthy sources, but rather to tell students to critically evaluate information from any source. The days of CNN being trusted blindly and random guy in Iran on the Internet being not trusted blindly are over -- we all know there are cases where random guy in Iran beats the pants off of CNN. The key is having the skills to "be your own reporter" and do some triangulation to figure out what's what. But the scientific publishing industry is a slow moving ocean-liner. I think the challenge for big projects (and entrenched industries like publishing) is to figure out how to navigate these change in mentality without losing half your audience. Chris, excellent write up. We all collectively groaned about the groans, though I'm not sure anyone was surprised? A discussion about the discussion regarding the discussion of planning a plan. Wow. The software wasn't great, the forum setup had too many places for people to post. However, it was standard enough that people who had used a forum before knew how to post a message. It's 2009, people already have 500 logins or they have a password manager. There was also the issue hijacking threads and that may have put people off - good point but until these (silverbacks?) are web-savvy enough, how can we expect them not to do that in a wiki or on twitter? All of them become difficult when they're misused (or broken - blogger was broken last night and the e-biosphere OCC has disappeared!). In e-bio's defense, not everyone has a blog they can post to and not everyone uses twitter. Everyone knows how to use a forum. I think that the organizers could have been a little more 'experimental' with the OCC - there was a wiki, realtime chat and twitter proposed but they decided to confine everything to a single forum. Clearly rejecting twitter was a mistake and a lesson for next time. However, those who wanted an e-bio presence on twitter just made one, correct? They didn't need anyone's blessing to do so, they just did it. Sometimes that's just how things get done. All the previous points are correct - without reaching out to the community and actively engaging with it, the #biodiv community will grow and mature slower. The most troubling aspect of all of this for me is the hesitation people had to use a tool, however imperfect, to make their thoughts known. There are plenty examples of crappy forums that have vibrant discussions, what makes the #biodiv community shy away from a forum is far more than the reasons listed above & before, I fear. This also ties into the perceived risk in splurging knowledge into an online format, whether that's a forum, wiki, mailing list, twitter, whatever. This is a common theme. I belong to many lists and forums where splurging knowledge is the only way that things work and it ends up being beneficial for all involved. I have colleagues at BHL, GBIF, EOL etc and just people on twitter to whom I give as much as I can in the hope that it's at least in part paying them back for what they give me. This fear of splurging knowledge online is the same mentality people in the #biodiv community have about putting data in places like EOL. I've had no shortage of discussions with people who are scared that places like EOL are going to "steal" their data, or that they don't see "why they should put their data there". My response to that is simply, wake up and look at the bigger picture. I don't come from a biology background so perhaps I don't see some parts of that picture, but I think I see enough to see that the community, #biodiv, @eoflife and #ebio09 have some serious work to do and at some point, people have to stop talking and start doing. That means that once in a while, people need to use their knowledge, research and data simply for the benefit of the wider community. One day people are going to get it, I just hope that when that day comes, we haven't lost too much biodiversity data (or, more importantly, biodiversity itself) because people were scared or didn't see the point in contributing their efforts. Hopefully the day doesn't come too late, so places like EOL will still hold value to the community and even encourage more people to join the community. Guaranteed that every day that passes while people still have this old school mentality driven by fear and mistrust of technology (which stretches beyond the silverbacks out there) the world will be worse for it. Sure, people argue against the value something like EOL has right now, but you can't deny the value in what it will become. You also can't deny the massive head start it had in its engagement with the wider community via TED and the massive worldwide pre-launch press it got. One thing this #biodiv community (including EOL to an extent) ironically fails to *get* is EOL, IMO. I think that if you ask a 15 year old student what EOL actually is, you'll get a better answer than the #biodiv community is able to come up with, and that worries me. Maybe e-biosphere should have gone for 28 minutes. Long enough to show these two videos followed by a single slide that said "Get to work". OK, I'll take the bait (and I really, really, wanted to be nice to EOL today). Sure, people argue against the value something like EOL has right now, but you can't deny the value in what it will become. Um, yes I can, until EOL shows me that they are able to deliver more than what they already have. Until then, you're selling a dream, and anybody can do that (lots have already). There is a yawning chasm between what EOL says it is shooting for, and where it is. In an earlier review of EOL I argued that a major change in the way EOL (as an organisation) thinks about data gathering is need if it has any hope of scaling up the task at hand. You also can't deny the massive head start it had in its engagement with the wider community via TED and the massive worldwide pre-launch press it got. Well, that's a double-edged sword. EOL's celebrity helps bring other players (e.g., Google) to the table, but at the same time raised expectations that EOL had no hope of meeting. EOL press releases border on fantasy. It's not clear to me what EOL's vision really is. If you're about species pages, well, Wikipedia beats you. If it's about science, then you'd better start changing the way you do things, because I can't doing anything scientific with EOL as it stands. That's not to say that I couldn't one day, but right now you aren't useful. "why they should put their data there". My response to that is simply, wake up and look at the bigger picture. While I agree with you that people are often loath to share data, and share the sentiment, " wake up and look at the bigger picture" won't cut it. You need a compelling benefit for the data providers. Self-interest is a powerful motivation. If your argument is basically "let's share it and make something cool", much as I buy it, most don't. Until EOL can demonstrate tangible benefits, you'll have a hard sell. And do what, exactly? Aye, there's the rub. I argued that a major change in the way EOL (as an organisation) thinks about data gathering is need if it has any hope of scaling up the task at hand. More importantly, it engaged people who were previously not that interested in the field. I don't think the importance of that can be overlooked. If your argument is basically "let's share it and make something cool", much as I buy it, most don't. Until EOL can demonstrate tangible benefits, you'll have a hard sell. Well, I hope that when the generation of self-interest motivated anti "share it and make something cool" folk become an extinct species themselves, people will get a grip and learn to share. Man, we had Rod being nice to us until antg came along! Nice job knucklehead! EOL's original vision at a very high level is pretty simple - build an expandable webpage for every species with all the information available for that species. To say "wikipedia has EOL beat" is simplistic -- the major species certainly are better summarized in Wikipedia, but they do not have everything, not even close and they likely never will. Even if most of our pages are "placeholders" (i.e. only a name and a classification and some deep outlinks), I hold that there is still value there. We started with pages for everything in CoL and now add pages for anything else as well. We eventually will have multiple classifications. The coverage is wide even if it not yet deep (and maybe never will be in many areas). Will EOL suit every purpose? Of course not. Wikipedia will be better at some bits, Google will be better in others, and so on. Maybe EOL in its current incarnation is not useful to scientists, but it has a solid reputation amongst the general public, and anything that encourages people to learn more about biology, biodiversity and protect the planet as a result is a worthy endeavor. Part of the "fear of sharing" bit is related to the current model for scientific career advancement. Unless you publish and have original work citable to you as a source, it is difficult to get funding and get promoted (and get tenure in universities). Until some adjustments are made to this model, it's hard to expect scientists to just share everything because it's the right thing to do. They have careers to advance and bills to pay like the rest of us. There will always be the "horders" of information out there, but I am sure must would love to share everything if they knew it wouldn't hamper their ability to thrive in the current scientific model of funding and career advancement. Disclaimer: I am not a scientist but my wife is. Awwwww schucks, I bet you say that to all your advocates. We eventually will have multiple classifications. The coverage is wide even if it not yet deep (and maybe never will be in many areas). ( watch videos repeatedly until it sinks in). Are they an indexer, aggregator, content producer? I for one don't think they have the luxury of choosing one or the other, but I also think that licensing, fear of wikipedia style inaccuracies, etc etc are all just annoyances the come between the idea behind the project and the execution of it. aaaargh! Don't care, don't care, don't care, don't care. Plus, I think people see this as an easy excuse rather than a realistic road block. Worst case this might delay some data getting into EOL right, once all the published data is in of course.. Does anyone know how much this issue has effected the wikipedia model? As far as I'm concerned, whilst it might be a 'problem', record companies thought the internet was a genuine problem for a while as well. I wish, but unfortunately I don't think this is the case. Hopefully I'm wrong but then I'd be ignoring everything I hear about people just not seeing the *point* in putting data in EOL, and the other associated "let's hate on EOL 'cause it's EOL" crap. Times change and people need to change with them. Viva la revolution. aaaargh! Don't care, don't care, don't care, don't care. Plus, I think people see this as an easy excuse rather than a realistic road block. I am not saying I like the model or that the 'excuse' is a good one, but pretending it does not exist makes no sense to me. Without publishing papers and bringing in grant money, people at the MBL, WHOI, and other soft-money institutions are essentially fired. Maybe at some government research jobs (NIH, USGS, etc.) you can do "what's right" but private institutions and universities want you to bring in money. You can't feed your family on good will and the advancement of science. Call me the pragmatic spoilsport if you will. Yes, and its good that Apple, Amazon and others have found a model to suit the times, unlike the record industry. If everyone continued to steal music with Napster as they did in the late 90s, that would have put everyone out of business (including musicians, who, last time I checked, also had families to feed). The "everything should be free" model is a tad naive -- what people really mean is "everything should be free except the work that I do, which should be expensive". Now that's a world I'd like to live in! pretending it does not exist makes no sense to me...Call me the pragmatic spoilsport if you will. I'm not pretending it doesn't exist, I acknowledge that it's an issue, but let's talk about it when it's the only thing stopping more data getting into EOL or the only thing preventing EOL from getting better. Has wikipedia hit the limit of data that's available in the world, less the yet to be published data? Yep.. what was I thinking? How could wikipedia ever work? I'm not suggesting everyone employed in the #biodiv community stops what they're doing and volunteers for EOL. I'm suggesting everyone should do what they can do to assist in building EOL... (or come up with a better idea). Unless you're suggesting that the #biodiv community doesn't have any knowledge they can part with without going broke, but I highly doubt that's the case. I'd like to take a time-out to have a minutes silence for all those sent themselves broke by editing wikipedia. ...and 'cause it's late in the day, what the hell I'm also going to throw in that I think it all stems from jealousy that E.O. Wilson came up with the idea first. #biodiv'ers have a unique opportunity at this moment in time to do something great, so less talk, more action. That's all I'm saying. First of, this is a great conversation, and now seems to be between Ant and I, who are separated by about 300 feet. The only thing I would add, per Wikipedia's own policies (in fact one it's three core principles - http://en.wikipedia.org/wiki/Wikipedia:No_original_research), is that Wikipedia is not intended as a place for original research, and this is the exact kind that scientists care about for the "reputation" that boosts their career. Nobody minds sharing already published data and papers -- it's the unpublished kind that matter (and that's the exact kind Wikipedia doesn't want). It just dawned on me.. what we really need is some kind of online forum to discuss these issues in. ok, I promise this is my last post. Yes I see the irony and hypocrisy of hijacking a thread in which I complained about hijacking threads. I'll end on this important note - I've discovered where the EOL direction question comes from!!! HOWEVER.. The link to the paper is broken. Therefore, my theory is... once that link is fixed, EOL will be linked back to the original concept and everything will be fine again. woohoo! Problem solved.